Click on the pictures to meet the team! 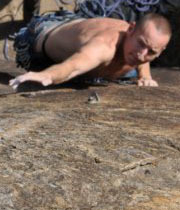 Steve is one of the most highly skilled instructors at Barbary Rock Adventures. He has been climbing for more than 35 years. Over this time he has perfected his outdoor, team leader, and training skills. He is a qualified Mountaineering Instructor (MIA GIB) and holds the SPA qualification and the MLTB Site Specific Trainers Award; he also possesses the Mountain First Aid and Emergency First Aid Qualifications. He is a member of the British Mountaineering Council and the Secretary of the Gibraltar Climbing Association, and an instructor at the GSLA climbing wall. Furthermore, he has been certified by the Institution of Occupational Safety and Health as a Health and Safety Manager. A natural born instructor, Steve effortlessly imparts his extensive knowledge to all his students. Simon is one of the most easygoing guys you will ever meet. 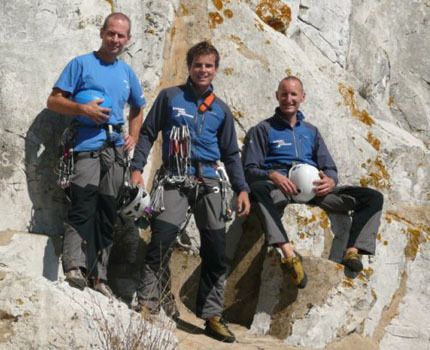 He is also one of Barbary Rock Adventures� most well-rounded instructors. Having been climbing for over twenty years he has built up a large repertoire of highly technical climbing skills, and a wealth of knowledge and experience. 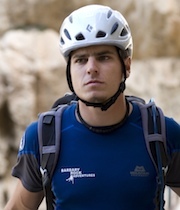 His extensive experience has seen him climbing in almost twenty different countries, and logging numerous first ascents. 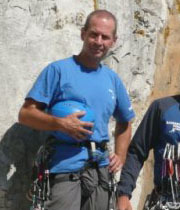 He is the President of the Gibraltar Climbing Association and an instructor at the GSLA climbing wall. When not out guiding or coaching, Simon can be found Deep Water Soloing or planning his next extreme climb at some remote part of the globe. Chris has an extraordinary passion for showing people the outdoors, and his thirst for adventure is only quenched when he is able to show people a side of nature very few ever witness. He has completed extensive training in a variety of fields to present himself as an expert guide, qualified Mountaineering Instructor (MIA GIB) and first aider. He has been climbing and trekking in the area of Andaluc�a and Morocco for numerous years and has recorded several first ascents on the Rock of Gibraltar. Chris has been undertaking outdoor activities since a very early age and successfully climbed Mulhacen (the highest peak in the Iberian Peninsula) aged only thirteen. He is a member of the British Mountaineering Council, the Gibraltar Climbing Association, and he is also a Climbing Instructor at the GSLA climbing wall. Nathan is serving as a Junior Instructor while completing a degree in Sport Science, specialising in Rock Climbing. He has already impressed us with his attention to detail and safety. You'll often find Nathan assisting on our team building and multi-sport programmes. 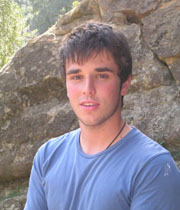 Nathan is also an active member of the Gibraltar Climbing Association.